Sometimes a story of a bug is so intriguing you have to write it down - so if you are technically minded or just curious about the realities of development on EVE Online. Join me for a deep-dive into the technical depths of the EVE Online code base, as I recount how one of the oldest defects in the game got hunted down and resolved! We're always working on improving EVE Online and our code base, and I hope you enjoy coming along on a journey of how this work can look. A little while ago CCP karkur asked me if I could help with an issue she had been looking into with the drone window, where it sometimes would stop updating when drones are being recalled. Her investigation did not uncover any bugs in the code related to drones or the UI. Over the course of a few hours, she managed to repro the drone bug 3 times, each time adding more logging where the problem seemed to lie. After the last repro, it became clear that it was failing at the least expected line of code - the drone window simply started updating, then went to sleep for a bit, but never woke up again - it seemed that tasklets were on occasion simply not returning from their sleep. The original bug was quite difficult to reproduce, but CCP karkur put together a script that generated 500,000 tasklets that simply sleep for some given time, with some tracking to identify tasklets that never finish. With this script, we've been able to reproduce this sleeping disorder somewhat reliably. This script identified the tasklet that didn't wake up, and upon inspection it was clear that the tasklet was neither scheduled nor blocked - it was in some sort of limbo. My first attempts at reproducing the bug with CCP karkur's script were not successful - I was running in Jessica (our authoring/debugging tool) without the client and didn't seem to have any luck. Later I tried in the client with better luck, so it seemed there was more to it than simply having lots of tasklets. I started reading through the relevant C++ code to try to come up with theories. Tasklets (see Stackless Python for more information) are run in PyScheduler::Run, by calling PyStackless_RunWatchdogEx. This method takes in a timeout value and runs any scheduled tasklets until the given time has passed. When a tasklet is created, it is scheduled and so will run when the PyScheduler::Run is called. When a tasklet sleeps, it calls Synchro::SleepWallclock, which is implemented by creating a channel and calling receive on the channel. This blocks the channel until somebody sends something on that channel. Synchro maintains a heap of sleepers - a sleeper is a simple object that holds the due time when the tasklet should wake up, and the channel. Synchro::Tick pulls sleepers from the top of the heap and sends a value on the channel. This in turn unblocks the tasklet and schedules it. My first idea was that there might be a bug in the heap code. It's our own code, it's old and there are no unit tests for it. I considered writing some tests for it, or even finding a suitable replacement, but then I realized the symptoms didn't match with the tasklet never being pulled from that heap. If that were the case, the tasklet would simply remain blocked forever. It's still on my to-do list to add tests for this code, though. My next idea came from looking at the documentation of PyStackless_RunWatchdogEx. It can return a tasklet, that should either be killed or rescheduled. That turned out to be a dead end - this only applies when running in preemptive mode, where a tasklet can be interrupted. I had a hunch that killing tasklets might be a factor in this, but I couldn't see anything wrong with the code around that. Nevertheless, I couldn't convince myself that the reference counting of the channel was correct, so I decided to clean up the code a bit. It felt awkward how it was done. //we were killed, so lets try and find us in the queue, to release resources. This all looks correct - the channel could not pulled out from under the tasklet until after the Send call. What happens when a tasklet is killed? //Ok found us. Let's delete us. Again, it all looks alright - the tasklet is removed from the heap and the channel is released. Note that it is not an error if the tasklet can't be found on the heap - it could have woken up and been scheduled on the same tick as it is being killed, but in that case the channel will have been released in Tick. In RemoveSleeper, which is called after a tasklet has been killed we're comparing channel objects. There should always be a one-to-one correspondence with tasklets and channels so we're effectively looking for a tasklet here, but since we needed to keep track of channels to wake them up, we just use the channels. I added a reference to the tasklet in the Sleeper object so that I could verify it here, and lo and behold, when running the scripts from CCP karkur I got a discrepancy - a tasklet was determined to be in the heap based on the channel, but the tasklet didn't match. When a channel object is deleted, its memory is now free and available for reuse. This implies that a tasklet that goes to sleep on the same tick as a tasklet is killed exactly when it wanted to wake up can get the same channel pointer as the killed tasklet. RemoveSleeper will in that case remove the wrong tasklet (the one that just called SleepWallclock) from the heap, kill it's channel, leaving it in a non-scheduled, non-blocked state. 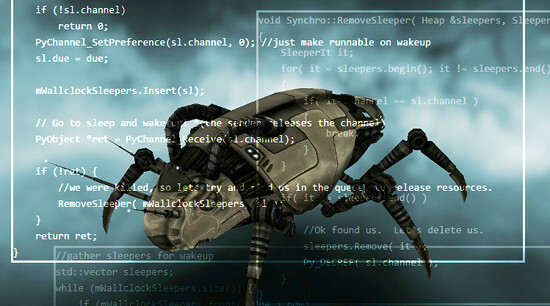 The fix is simple - move the Py_DECREF calls into SleepWallclock. This ensures that channel objects are not recycled prematurely, and in my opinion is actually cleaner, keeping the reference counting localized in one function. EVE Online is almost 14 years old now and has seen many battles during its lifetime, and one can say the code base is thoroughly battle tested. However, that doesn't mean sneaky bugs might not be hiding there, but finding a bug in such a fundamental function was surprising, to say the least. I guess we can never assume that any part of our code base is absolutely 100% correct. CCP karkur and others have spent a considerable amount of time tracking this issue down so we had high confidence in the higher level code. This allowed me to go into this investigation on the assumption that Sleep was broken, being stubborn until I found this rare edge case. We have reason to believe that a few other bugs are symptoms of the same underlying issue - the overview not updating, for example, or the shield, armor and structure bars not updating. These bugs have always been nearly impossible to reproduce but nevertheless are reported occasionally, especially after mass tests or heavy fights on Tranquility.